Pachmarhi is a hill station in Madhya Pradesh state of central India. It's widely known as " Satpura ki Rani", situated at a height of 3500 ft. in a valley of the Satpura Range in Pandav Caves PachmarhiHoshangabad district, 32 miles by road from Piparia station on the Indian Railways. Piparia is 2 hrs Train run from Jabalpur. All the trains departing towards Itarsi from Jabalpur pass through Piparia, but only a few halt here. The area was discovered in the modern times by Captain James Forsyth of the British army in 1857 Pachmarhi became a hill-station and sanatorium for British troops in the Central Provinces of India. The population in 1901 was 3020, rising to double that number in the hot summer months. 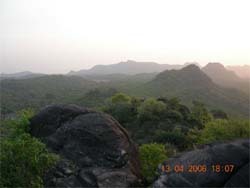 Pachmarhi also served as the summer capital. Among the few exceptional hill resorts in India, is Pachmarhi is Madhya Pradesh. It is not on the usual beat of hill station buffs and therefore, not over-developed. Though considered a hill station, it does not offer the predictable mountain fare of awesome heights and spectacular scenery, for the Satpuras are low lying weathered hills. Pachmarhi' s appeal is low key. Peace, seclusion and a quiet unobtrusive beauty are its prime attractions. Pachmarhi has a somewhat fateful history. The year that Rani of Jhansi and her Maratha soldiers declared Mutiny, a rather prosaic English officer who had a way with words, was sent to the dense Satpura jungles to quell a rebellion. After walking for 17 miles, Captain Forsyth of the Bengal Lancers found himself 2000 feet above the sea and a saucer-shaped plateau spread out before him. The vegetation had changed. The dry yellow grass and naked tree stems had given way to dense green undergrowth, moist banks of streams were covered with ferns and mosses and clear brooks refreshed the tired troops. The village of Puchmurree was still some miles distan, and we hurried along over the now almost level plateau to get shelter as soon as possible, as we had already walked almost seventeen miles and the sun was about to set,” wrote the captain in a book later. At this point in history, the population of tigers, leopards, bear and other carnivores was fairly significant in the dense jungles of Satpura – and we can presume the captain and his troops didn’t want to be supper to them. Even today, one may get an occasional sighting of the cats. Or certainly, the census records their existence. The captain was obviously taking his notes. He mentions the genus of the trees he encountered – a lot of jamun and mango amongst them (they still thrive) and – it must have been the homesickness – he gets annoyingly parochial. “…Altogether, the aspect of the plateau was much more that of a fine English park than of any scene I had before come across in India,” he notes. Obviously, he hadn’t been privileged to visit Shimla yet. As the name suggests, these caves are said to be associated with the Pandava brothers. Now protected monuments, these caves are excavated in a hill made of sandstone rock. These ancient dwellings are famous for having provided shelter to the Pandavas. Set up in 1981, it covers an area of 524 sqkm. It has a dense forest of evergreen, sal, teak and bamboo. The park is home to the bison, tiger, leopard, bear, four-horned deer, blue bull and a large variety of birds. As said above, these cave shelters with their paintings provide a glimpse into the lifestyle, religious and social activities and beliefs. A must see for those with an inclination towards history. A beautiful picnic spot which is ideal for children, as the pool is shallow and deepens only towards the base of the fall. Mahadeo hill has a shrine with an idol of Lord Shiva and an impressive Shivalinga which has been considered holy over many generations. On the east side is a cave shelter with paintings. This is Pachmarhi’s most impressive ravine with a 300 feet high precipice. 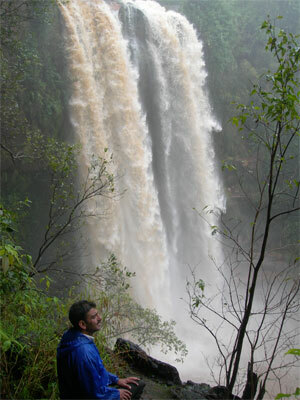 Pachmarhi is one of the most popular hill stations in Madhya Pradesh. deriving its name from a group of five caves, which, according to legend, served as shelter to the five Pandav brothers during their exile. The hill resort of Pachmarhi lies in the Satpura ranges, at an altitude of 1,100m. 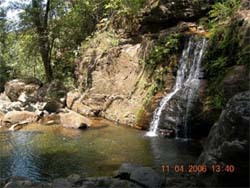 At Pachmarhi there are tranquil forests along with deep ponds and lava hills. Formed of red sandstone, the valley, ravines and the maze of gorges at Pachmarhi are attractive. Jaistambha – Jaistambha or satrasta is the only point of Pachmarhi from where seven different paths depart .For sightseeing of Pachmarhi ,Jaistambha can be taken as a starting point for maximum spots. Bees Falls – Bees falls is hardly 3KMs from Jaistambha .Right turn crossing the Governor house or Rajbhavan & you will be on jungle road towards Bees falls. Leaving the Gypsy after a short walk going down a beautiful water stream appears which is usually used as a bathing pool by the visitors .This water stream flows & jumps into the valley to make one of the most beautiful waterfalls of Pachmarhi Fall makes a buzzing sound as thousand of bees are singing & accordingly called Bees fall. This spectacular fall leaves long lasting memory when one stays under its cold, fresh & pure water which falls directly from the height of 200 ft & soothing feeling of its stroke on ones head is unforgettable experience. 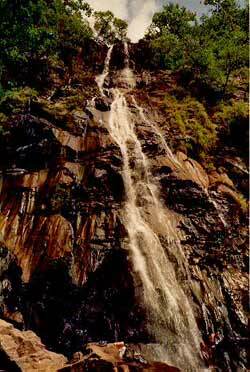 Duchess Falls - Duchess fall is the most beautiful waterfall of Pachmarhi. From Jaistambha take the same road which goes towards Bees fall. Just before turning before turning towards airstrip, turn right & after almost 1KM vehicle has to be left & trekking is essential to reach the waterfall. Lots of stamina & patience is required to get this beauty in the lap of Satpura. Adventurous trekker can visit Sunderkund, Vijay Prapat, Dorothy Deep & bhrant neer in this region. Pachmarhi Lake (Zheel) – Pachmarhi lake is located just 400 Meters from Jaistambha .From this lake Dhoopgarh highest peak of Satpuras looks like a fort. It is surrounded by lush green trees & has a panoramic view .Here boating, camel & horse rides ,toy motorbikes are available for amusements. Apsara Vihar (Fairy Pools) - From Pandava caves drive of around 1 & ½ KM in Gypsy & trekking of 2KM in jungle & you are at “Fairy Pools” or “Apsara Vihar” .It is an ideal picnic spot. A small charming waterfall of 30ft. height Makes the pool. Care to be taken of Children & non swimmers here. Swimmers can enjoy swimming with diving in this natural pool. Silver Fall (Rajat Prapat) – Water Stram of Fairypools falls into a valley making a big fall named Silver fall ,it falls into a depth of around 350 ft.For adventure lovers there is a way to go down ,but with children & family it is not advisable. Bada Mahadeo Cave – Bada Mahadeo hill (1362 Mt. above mean sea level) is nearly 10 KM from Pachmarhi. In the lap of this hill anceint pious cave is place of prominent tourist interest. On way Handikhoh & Priyadarshini arte spots of panoramic cviews. Gupta Mahadeo ,a narrow cave of 40Mt length ,is onle half an Km far from Bada Mahadeo .Bada Mahadeo Cave is about 20` in width & 50` in length. Inside the cave a sacred pond exists ,in which religious dip is taken by devotees. A natural anceient Shivalingam is worshipped here.On Maha-Shivaratri millions of Shiva devoptees come to worship Mahadeo with loud slogans of “Har Bhola Har Har Mahadeo “. Chouragarh – Chouragarh is 1316Mts.above mean sea level .It is nearly 3 Km from Bada Mahadeo.To reach the top of the hill one has to climb around 1,250 steps. As an offering to lord Shiva thousands of of Trishuls (Tridents_ are put by the devotees on the top, some of which weigh around 3 to 4 quintals.Chouragarh presents beautiful scenes of dense forest, valleys, hills & distant tribal villages in lap of Satpuras. Jatashankar – Jatashankar is on the entrance road of Pachamrhi. It is one of the nearest & most beautiful spot of Pachmarhi. The temperature at cave is around 3-4degree lower than Pachmarhi town. Natural Shivalingam under the shade of huge rock formation of Naga is the place of worship as well main attraction here. Huge rock hanging precariously between the rocky walls of the cave is a memorable scene. This miracle of nature reminds powers of almighty. How to reach Pachmarhi ?